Search Ads are text advertisements that can appear above or below search results on Google based upon a user’s search queries, or keywords. They can also appear beside, above, or below search results on Google Play, Google Shopping, and Google Maps, including the Maps app. Display Ads are graphic images that are used to advertise a product or service through Google’s Display Network. Commonly known as banner ads, Display Ads function differently than text ads because they are not found in search results. They can be found on websites and apps and appear in many shapes and sizes to attract the user to take a specified action. Re-targeting can also be used for these ads. For example, on ecommerce or shopping site a user may place something in his or her cart and then leave the site without purchasing. 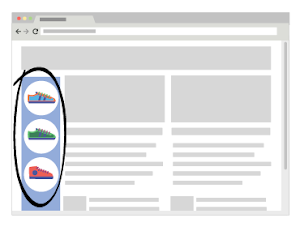 Ads can then be used to advertise exactly what that user placed in his or her cart to get them to complete the purchase that they left before. Display Only campaigns do not utilize text Search Ads. Display only campaigns are also the only campaigns that can utilize custom affinity audiences. Display only campaigns can take data from similar websites (such as direct competitors) and retarget towards those that frequent their websites. This option is only available to campaigns that are display only. This should be taken into consideration when determining what campaign, or combination of campaigns, are the right strategy for your business. 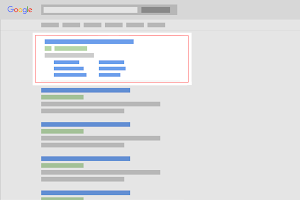 Search Advertising with Display Extension allows for both Search and Display to be housed under one single campaign. This is beneficial to companies who would like to utilize both types of advertisements but have a limited daily budget. The daily budget will go towards Search clicks first and Display clicks second. Search ads can only target locations, prior search history and demographics (audiences). Display ads have the added targeting of specific website placement and website topics because they are viewed outside of search results. Search with Display is not always the best choice. Despite the Search with Display option seeming like the go-to choice, it does have a few pitfalls. First of most is that your budget will be allocated towards search before display. Display tends to have a cheaper cost-per-click (CPC) and can be a powerful tool in terms of brand identity and customer recall. Display also tends to attract more clicks due to its visual appeal. If you have a combination campaign of search and display, the display feature will not be utilized to its full extent. Furthermore, it restricts your ability to target custom audiences based upon related websites or browsing history. Budget can dictate your campaign number. Another factor to keep in mind when choosing your campaign type is your overall budget. The daily budget is controlled at the campaign level. So, if you include all your business’s service lines (or “buckets” as we commonly call them), all service lines must share from the same single budget. This means that you will not be able to promote one “bucket” over another. While this is not an issue for all businesses, some would like to have the ability to control how much advertising goes towards what service. To do this, separate campaigns would have to be made for each service. For example, you own a hair salon that also offers nail services. Hair services account for over 75% of your company’s revenue while nails only occupies 25%. You find that you need to increase your nail service profits in order to offset the overhead cost of supplies and staffing. You decide that advertising your nail services in Google Ads will bring you those extra clients. Additionally, you don’t want to abandon all advertising efforts for hair, so you would like to include advertisements for hair services in your Google Ads strategy. You would like to spend no more than $20 a day in clicks (ad spend) each month. Your initial plan is to have both services housed under one single campaign as separate ad groups. You then add all of the relevant keywords relating to all your array of services within each topic to each ad group, resulting in large ad groups with very generalized advertisements. You quickly find that hair exhausts a majority of your budget and attracts the most clicks, leaving nails with barely any advertising. This is the opposite of your goals and find yourself unable to push nails more than hair in this current structure. Instead, two separate campaigns should have been created – one for hair and one for nails. The separate campaigns would allow for the ads to have their own individual budgets and operate independently from one another. In this case, the nails campaign would have a higher budget of $12/day and the hair campaign would use the remaining $8/day. Also, by separating the topics down into separate campaigns, subsections from each service could then be broken into ad groups and provide highly tailored advertisements relevant to specific keyword searches. No two companies are identical to one another. Every company is different. They have distinguishable traits that make them stand apart from the crowd and keeps their customers coming back again and again. Just like there are no two identical companies, there are no identical Google Ad campaigns. Google Ads should never be approached with a one-size-fits-all method. It is a constantly varied, ever changing advertising platform. Those that see it as a set-and-forget type of outlet will find that their advertising endeavors won’t produce positive results. The best way to get the most out of a Google PPC campaign is to have a targeted, ever-evolving strategy that requires constant tweaking and adjustments to result in a high return on investment (ROI). It is for this reason that, unless you are a PPC pro, we suggest hiring a PPC management service, such as Boost Creative. The team at Boost Creative are up to date on all the best practices of PPC and Google Ads, and have experience optimizing accounts to provide clients the best ROI possible. Contact us today if you are interested to learn Boost can help your pay-per-click marketing efforts.